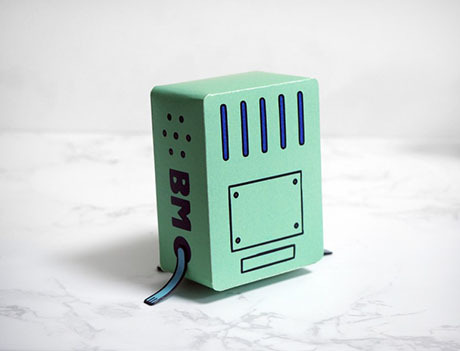 BMO (an abbreviation for Be More, phonetically spelled "Beemo"), is Finn and Jake's living video game console system, portable electrical outlet, computer, music player, VCR, video player, video editor, roommate, camera, alarm clock, toaster, flashlight, strobelight, skateboarder, soccer player, tape player, chef and friend. They make their appearance in the title scene of the Theme Song of every episode of Adventure Time, just as Finn and Jake pound their fists together. 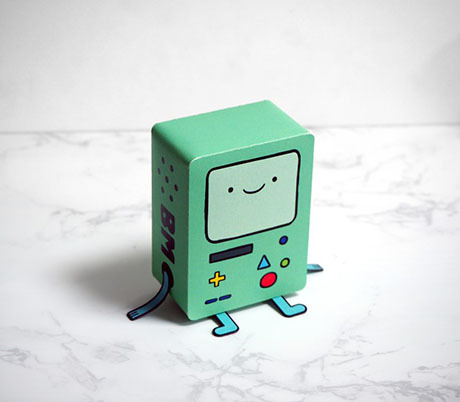 BMO is characterized as a loyal, trusting and helpful robot who is protective of Finn and Jake. Papercraft created by Constable from Poppaper1.